Here’s a cute little dwarf from a Snow White and the Seven Dwarves vintage Christmas ornament set. The dwarf is a vintage pre-war II (about 1938) made in Germany for Disney. It is a cardboard paper mache candy container Christmas tree ornament still with its hanging string but missing the hand tag identifying it as Disney. 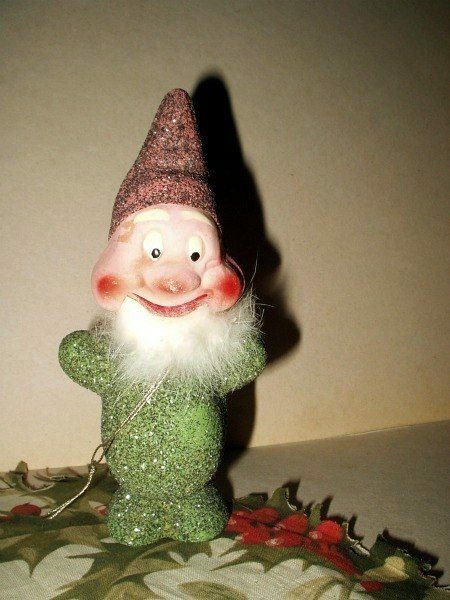 The dwarf is mica or glitter covered except for the head. Head removes from the body to reveal the container for candy. Rabbit fur beard.